"Besides your typical liver, bacon and onions; this is my 2nd all time favorite liver recipe. It's sooo good. Even when my daughters were young, they ate it, and liked it. Trust me, it's good." In a large skillet over medium heat, fry bacon until browned and crisp. Remove from pan, cool and crumble. Keep the grease in the pan. Dredge the liver slices in flour seasoned with salt and pepper. Fry liver in the bacon drippings over medium-high heat until browned on the outside. In a small bowl, mix together the French onion soup and chili sauce. Pour the mixture over the liver, cover, reduce heat to low, and simmer for 15 minutes stirring occasionally until tender. Remove lid, and continue cooking liver to desired doneness. 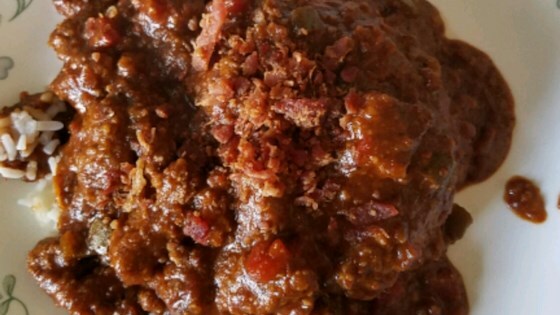 Serve liver and sauce topped with crumbled bacon. This recipe will make a liver lover out of even the pickiest eater.